Paraná (Portuguese pronunciation: [paɾaˈna]) is one of the 26 states of Brazil, in the south of the country, bordered on the north by São Paulo state, on the east by the Atlantic Ocean, on the south by Santa Catarina state and the province of Misiones, Argentina, and on the west by Mato Grosso do Sul and Paraguay, with the Paraná River as its western boundary line. Its area is 199,307.9 km2 (76,953.2 sq mi), slightly smaller than Romania, a country with similar shape. It is subdivided into 399 municipalities. Its capital is the city of Curitiba. Other major cities are Londrina, Maringá, Ponta Grossa, Cascavel, São José dos Pinhais and Foz do Iguaçu. Crossed by the Tropic of Capricorn, Paraná has what is left of the araucaria forest, one of the most important subtropical forests in the world. At the border with Argentina is the National Park of Iguaçu, considered by UNESCO as a World Heritage site. At only 40 km (25 mi) from there, at the border with Paraguay, the largest dam in the world was built, the Hidroelétrica de Itaipu (Itaipu Hydroelectric Dam). The crime rate is considered low by Brazilian standards and the state is one of the most developed ones in the nation, ranking 4th in gross domestic product, only behind the states of Rio de Janeiro, São Paulo and Minas Gerais. Before the discovery of the region by European explorers, indigenous populations inhabited the region for thousands of years. This included the Carijó in the lands closer to the sea, from the Tupi group, and the Caingangues in the interior, who belonged to the Jê group. Colonisation of the state by settlers started in the 16th century, but was mainly confined to the coasts. Being a region mostly abandoned by the Portuguese, the region was explored by other European countries, who searched primarily for Pau brasil. The most noteworthy presence was that of the Spanish, which brought with them jesuits. Soon, Jesuit reductions were opened in the western and south-western parts of the state, whose territory largely belonged to the Spanish crown. In 1554, Domingo Martínez de Irala founded the town of Ontiveros, one league away from the Guaíra Falls. In the 1940s, the northern part of the state was settled as a result of the expansion of the São Paulo coffee industry. The south-eastern part of the state was settled as a result of migration from Rio Grande do Sul. 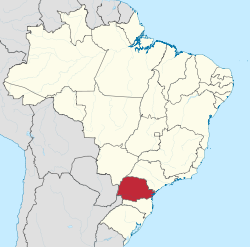 Paraná is bounded on the north by São Paulo state, on the east by the Atlantic Ocean, on the south by Santa Catarina state and the Misiones Province of Argentina, and on the west by Mato Grosso do Sul and the republic of Paraguay, with the Paraná River as its western boundary line. The state can be separated into five main topographic areas, from east to west: a coastal zone, the mountains of Serra do Mar, and then three plateaus, each lower than the other, until the Paraná River is reached. More than 52% of Paraná's territory is located at an altitude above 600 m (2000 ft.) and 89% higher than 300 m (1000 ft.); only 3% is located at an altitude of less than 200 meters (660 ft.). The planed areas that are arranged to the altitudes of higher elevation, which compose plateaus of cliffs forming the mountains of the Sea and the General mountain range, dominate the relief of the state. The lowest plots are situated in the coastal lowland, which covers alluvial plains, sands and crystalline hills; the north part is fragmented giving origin to the bay of Paranaguá, which resembles the aspect of a finger. Crossing the Tropic of Capricorn the state's climate is basically warm temperate or subtropical even in cities north of the imaginary line, although with considerable differences on the border of Mato Grosso do Sul to the Campos de Palmas by altimetric variation than latitude. In most applications of the Köppen climate classification, humid subtropical climates of the Cfa :in the northern central areas with trim to the west (hot summer) and Cfb: in the center of the state, going further south and east, according to the elevation of plateau (warm summer or occasionally hot) types appear. Other official maps also present in a higher resolution other subtypes of climates. The coastal approximate with a rainforest tropical climate (Af). Although studies officially state the Cfa climate on the state coast. To the northwest the trend is approaching the A highland subtropical climate (Cwa) as the west of São Paulo: reduction of rains and the number of frosts falls on the transitory character of the 3rd plateau to a climate with winter warmer and less rainy. The area is also more likely to stay longer on the domain of tropical air masses than other regions (or Aw in the frontier and consequently even warmer). Species such as Barirí palm (Cocos sp.) begin to appear as those found in Central Brazil. The use of the ECMWF model allows the greatest number of climatic types because virtual stations are included and fringes of climates with dry seasons (Aw and Cwa) so appear in the north. Other models usually appear only Cf. Palmas is considered the coldest city of Paraná by the meteorological organ SIMEPAR, with more frequent snow. The temperature variation NW-SE is a common characteristic, changing towards the south when it reaches the center of Paraná. The temperature varies from 22.9 °C in the northwest of the state (e.g. Loanda) to below 16.5 °C in the southern end (e.g. Palmas). Precipitation is less than 1200 mm (e.g. Jacarezinho) in most of the fringe of the extreme north and northeast going above 1800 mm in the southwest of the state (e.g. Pato Branco), therefore an NE-SE variation, although it extends more to the west in the north (border with São Paulo) the lower precipitation. Foz do Iguaçu has one of the largest thermal amplitudes of the cities of Paraná by its position more interior than several other municipalities. Average temperatures can vary by 11 °C between winter and summer, occasionally the city can pass from 40 °C, very hot summers in relation to the cities of the plateaus. Some studies on the state's climatic evolution between 1970-1999 state that the weight of the urban landscape modifies less heavily on the changes seen as temperature increases than other factors such as phenomena such as ENSO and global warming. Indicating the elevations of the minimum temperatures mainly in the south and the east (in this associated to the factor of the maritimity and urbanization). The Cfa climate, subtropical with good distribution of annual rainfall and hot summers, happens in both different parts of the state, the coastal plain and parts of lower altitude of the plateau, that is, in its western part. Average temperatures recorded per year is 19 °C (66 °F) and rainy index of 1,500 millimetres (59.1 in) per year, something higher elevation on the coast than inland. The cities with this climate include Londrina, Maringá, Cascavel, Foz do Iguaçu and Paranaguá. The Cfb climate, warm to hot temperate with good distribution of annual rainfall and mild summers, takes place in the portion of higher elevation and covers the crystalline plateau, the paleozoico plateau and the eastern portion of the basaltic plateau. The average annual temperatures range around 17 °C (63 °F) and the rainy index reaches more than 1,200 millimetres (47.2 in) per year. Cities with this climate include Guarapuava, Ponta Grossa and even the state capital. The relatively flat relief in Curitiba surrounded by mountainous forms in the metropolitan region provoke mild winter, blockade of winds, fog in the morning and floods by heavy rains. Snow is a phenomenon occasionally visible in the region (once per decade on average). The Cwa climate, subtropical with hot summers and dry winters, has occurred in the north-western part of the state territory. It is what is called a tropical climate, because in contrast to the two described above, whose good distribution of rainfall is registered throughout the year, this has characteristic rainy index of tropical systems, with dry winters and wet summers. The thermal medium per year varies around 20 °C (68 °F) and the wet content amounts to 1 millimetre (0.0 in) to 300 millimetres (11.8 in) per year. Almost the entire state territory is subject to a great number of frost per year. Cities with this climate include Paranavaí (according with Maack) with some characteristics - Cfa(h), transition with a humid climate all year round. Parana is the sixth most populous state in Brazil, with 11,800,000 inhabitants in 2014. Its level of urbanization is 83.5%. The 2005 IBGE survey gave the following breakdown by race for the state: White (Branca) 8,614,000 (73.0%), Pardos (mixed) 2,749,400 (23.3%), Black (Preta) 295,000 (2.5%), Yellow 118.000 (1%) and Amerindian 23,600 (0,2%) . Parana's white population is primarily descendant of Portuguese, Italian, Polish and Ukrainian immigrants, but many German and Japanese families also settled in the state. A variation of German known as Paraná-Wolga-Deutsch originated in the area. Initially settled by the Guarani and Kaingang Amerindians, until the 17th century, virtually no European presence existed in Paraná. The number of settlers grew around 1750 and the population was composed of Amerindians, Portuguese, and some Spaniards. African slaves from Angola and Mozambique were also present, but in fewer numbers than in other Brazilian areas, because Paraná was an unexplored region that did not need much slave manpower. As part of the province of São Paulo, immigration grew in the mid-19th century, mostly composed of Italian, German, Polish, Ukrainian, and Japanese peoples. While large numbers of Poles and Ukrainians are present in Paraná, their presence in the rest of Brazil is relatively small, especially Ukrainians. In the early 20th century, two waves of migration to Paraná occurred: one coming from the north, mostly of Portuguese, but also of African and Amerindian origin, and another from southern Brazil to the southwest and west, mostly of Portuguese, Italian, and German origins. In 2013, the Paraná had the fifth largest GDP of Brazil, representing 5.90% of the Brazilian GDP in 2005, against 6.4% in 2003. About 15% of Paraná's GDP comes from agriculture. Another 40% comes from industry and the remaining 45% comes from the tertiary sector. As for its exports, in 2012 the main products exported were soybeans (18.73%), Meat Poultry (10.50%), sugar in Natura (8.09%), Soybean Meal (8.00%) and corn (6.36%). The main economic activities are agriculture (sugarcane, corn, soybeans, coffee, tomato), industry (agribusiness, automotive, and paper) and plant extraction (wood and yerba mate). Despite the good social indicators and high standard of living, unemployment is still a problem and the state is one of most difficult for foreigners trying to find jobs. Afonso Pena International Airport is Curitiba's main airport. It is located in the nearby city of São José dos Pinhais. Two of the biggest football sides in the state are Clube Atlético Paranaense and Coritiba Foot Ball Club, who play the Atletiba derby. Curitiba was one of the 12 host cities of the 2014 FIFA World Cup. ^ "POPULAÇÃO RESIDENTE, EM 1o DE ABRIL DE 2007, SEGUNDO AS UNIDADES DA FEDERAÇÃO" (PDF) (in Portuguese). IBGE. Retrieved 21 April 2013. ^ In Brazilian Portuguese. The European Portuguese pronunciation is [pɐɾɐˈna]. ^ Chisholm, Hugh, ed. (1911). "Paraná" . Encyclopædia Britannica. 20 (11th ed.). Cambridge University Press. p. 766. ^ Paraná, Jornal Bem. "Jovem é assassinado com vários tiros em Campo Largo -". www.bemparana.com.br (in Portuguese). Retrieved 2019-01-29. ^ Pamplona, Nicola (28 November 2016). "Estados mais ricos ainda concentram PIB, mas participação cai, diz IBGE". Bem Paraná. Archived from the original on 29 November 2016. ^ "Contas Regionais 2014: cinco estados responderam por quase dois terços do PIB do país". IBGE. 28 November 2016. Archived from the original on 28 July 2017. Retrieved 23 November 2018. ^ CELEPAR. "Etnias - Estado do Paraná". www.cidadao.pr.gov.br (in Portuguese). Retrieved 2018-05-01. ^ a b Mascarenhas, Maria Amélia; Biasi, Mauro De; Coltrinari, Lylian; Moraes, Antônio Carlos de Robert de (1998). "Paraná". Grande Enciclopédia Larousse Cultural (in Portuguese). 18. São Paulo: Nova Cultural. pp. 4444–4445. ^ "Estado do Paraná". Encontra Paraná. 2017. Retrieved 2018-07-31. ^ "Supporting the Contribution of HEIs to Regional Development" (PDF). Secretariat of Science, Technology and Higher Education, State of Parana. Retrieved 21 April 2013. ^ "Paraná". Encyclopædia Britannica. Retrieved 6 January 2013. ^ CELEPAR. "Classclim_apresentacao - Instituto Agronômico do Paraná - IAPAR". www.iapar.br (in Portuguese). Retrieved 2018-11-11. ^ "Clima - Estado do Paraná". Instituto de Terras, Cartografia e Geociências. ^ "Clima". www.cnpf.embrapa.br. Retrieved 2018-11-11. ^ Vanhoni, Felipe; Mendonça, Francisco (2008). "O CLIMA DO LITORAL DO ESTADO DO PARANÁ". Revista Brasileira de Climatologia. 3 (0). doi:10.5380/abclima.v3i0.25423. ISSN 2237-8642. ^ Müller, Nice Lecocq (2012-01-06). "Contribuição ao estudo do norte do Paraná". GEOGRAFIA (Londrina) (in Portuguese). 10 (1): 89–119. doi:10.5433/2447-1747.2001v10n1p89. ISSN 2447-1747. ^ a b Aparecido, Lucas Eduardo de Oliveira; Rolim, Glauco de Souza; Richetti, Jonathan; Souza, Paulo Sergio de; Johann, Jerry Adriani; Aparecido, Lucas Eduardo de Oliveira; Rolim, Glauco de Souza; Richetti, Jonathan; Souza, Paulo Sergio de (2016-08-01). "Köppen, Thornthwaite and Camargo climate classifications for climatic zoning in the State of Paraná, Brazil". Ciência e Agrotecnologia. 40 (4): 405–417. doi:10.1590/1413-70542016404003916. ISSN 1413-7054. ^ "Parecer do Simepar confirma Palmas como a mais fria do Paraná". Prefeitura Municipal de Palmas. ^ a b CELEPAR. "Clima do Paraná - Turismo no Paraná". www.turismo.pr.gov.br (in Portuguese). Retrieved 2018-11-11. ^ Nogarolli, Mozart (2006). "EVOLUÇÃO CLIMÁTICA DO ESTADO DO PARANÁ: 1970 - 1999". REVISTA GEOGRAFAR (in Portuguese). 1 (1). doi:10.5380/geografar.v1i1.7396. ISSN 1981-089X. ^ a b c Garschagen 1998, p. 133-134. ^ "Londrina, Parana Köppen Climate Classification (Weatherbase)". Weatherbase. Retrieved 2018-11-11. ^ "Maringá, Parana Köppen Climate Classification (Weatherbase)". Weatherbase. Retrieved 2018-11-11. ^ "ANÁLISE DAS MACROZONAS DO PLANO DIRETOR DO MUNICÍPIO DE CASCAVEL – PARANÁ: ASPECTOS FÍSICOS E DE GESTÃO" (PDF). ^ "Foz do Iguacu, Parana Köppen Climate Classification (Weatherbase)". Weatherbase. Retrieved 2018-11-11. ^ "Paranagua, Parana Köppen Climate Classification (Weatherbase)". Weatherbase. Retrieved 2018-11-11. ^ "Guarapuava, Parana Köppen Climate Classification (Weatherbase)". Weatherbase. Retrieved 2018-11-11. ^ Cruz, Gilson Campos Ferreira da (2009-11-26). Clima urbano em Ponta Grossa - PR: uma abordagem da dinâmica climática em cidade média subtropical brasileira (Thesis) (in Portuguese). Universidade de Sao Paulo Sistema Integrado de Bibliotecas - SIBiUSP. doi:10.11606/T.8.2009.tde-05022010-141629. ^ "Curitiba, Parana Köppen Climate Classification (Weatherbase)". Weatherbase. Retrieved 2018-11-11. ^ "Evolução climática do Estado do Paraná" (PDF). ^ "Brazil will improve the urban infrastructure in the state of Paraná". Inter-American Development Bank. 18 December 2014. Retrieved 4 May 2015. ^ "Tabela 9.1 - População total e respectiva distribuição percentual, por cor ou raça, segundo as Grandes Regiões, Unidades da Federação e Regiões Metropolitanas - 2005" (PDF). Síntese de indicadores sociais 2006 (in Portuguese). IBGE. p. 248. Archived from the original (PDF) on 8 October 2013. Retrieved 21 April 2013. ^ Higher Education in Regional and City Development: State of Paraná, Brazil (PDF). OECD. 2011. p. 38. ISBN 978-92-64-089020. ^ "Wayback Machine (Indo-European phylosector)" (PDF). web.archive.org. 2005-12-31. Retrieved 2019-01-29. ^ Saloum De Neves Manta, Fernanda; Pereira, Rui; Vianna, Romulo; Rodolfo Beuttenmüller De Araújo, Alfredo; Leite Góes Gitaí, Daniel; Aparecida Da Silva, Dayse; De Vargas Wolfgramm, Eldamária; Da Mota Pontes, Isabel; Ivan Aguiar, José; Ozório Moraes, Milton; Fagundes De Carvalho, Elizeu; Gusmão, Leonor (2013). "Revisiting the Genetic Ancestry of Brazilians Using Autosomal AIM-Indels". PLOS ONE. 8 (9): e75145. doi:10.1371/journal.pone.0075145. PMC 3779230. PMID 24073242. ^ "Brazil: Paraná". City Population. Retrieved 20 April 2016. ^ "Exportações do Paranpa (2012)". Plataforma DataViva. Archived from the original on 14 January 2014. Retrieved 13 January 2014. ^ MANTOVANI, Ana Margô (June 2003). "Paraná: Economia". Laboratórios de Informática Unilasalle. Archived from the original on 18 January 2012. Retrieved 15 July 2011. ^ Portal, Mariana Ohde Repórter no Paraná (2017-08-18). "Taxa de desemprego fica em 8,9% no Paraná". Paraná Portal (in Portuguese). Retrieved 2019-01-29. ^ "Atlético-PR VS Coritiba: Atletiba, the rivalry that went national". Rivalries. FIFA. Retrieved 17 August 2014. Wikimedia Commons has media related to Paraná.